PLO Secretary-General blasts President Rivlin's tour of the Binyamin region. 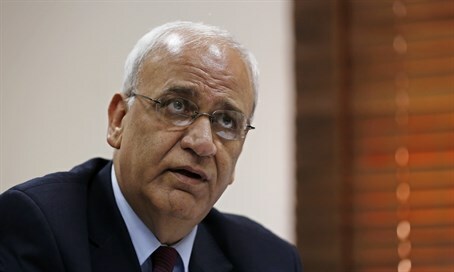 Saeb Erekat, the Secretary-General of the Palestine Liberation Organization’s (PLO) Executive Committee, on Tuesday blasted President Reuven Rivlin over what he termed his “visit to the Israeli settlements”. He was referring to Rivlin’s tour on Monday of the Binyamin region of Samaria, as a guest of Yesha Council leader Avi Roeh. The Yesha Council represents the Jewish communities of Judea and Samaria. “The Israeli President knows very well that settlements are not only illegal, but they amount to a war crime,” Erekat charged. During his visit to the Binyamin region, Rivlin recounted how he told President Barack Obama that a "two-state solution" to the Israeli-Arab conflict is "irrelevant." Addressing a group of some 80 local community leaders at Psagot winery just north of Jerusalem, Rivlin described his last meeting with Obama at the White House. "I told President Obama that the two-state solution is not relevant - that is my personal opinion," Rivlin said. Erekat, who used to serve as the chief negotiator for Israel-PA peace talks, has continuously attacked Israel over its alleged refusal to engage in talks, even as PA chairman Mahmoud Abbas has rejected Prime Minister Binyamin Netanyahu’s invitation for direct talks. Just last week, he rejected Netanyahu and Defense Minister Avigdor Liberman’s statement in favor of peace talks and the two-state solution. “We are used to Netanyahu and his government's inconsistencies and contradictions between words and actions," Erekat charged. "Peace must translate words into action by, first and foremost by ending the manufacture of facts on the ground, the cessation of settlement, ending the Judaization of Jerusalem, stopping extrajudicial executions, halting all demolition of homes, releasing the detention of bodies, lifting the siege, recognition of the 1967 borders, and to respect and implement the signed agreements,” he added.